Now that I think about it, we must have been quite nuts to decide that we should introduce Q to the world of robots. We don’t mean to show him what robots are (he already knows that), but rather, take him behind the scenes to see how robots are made. We originally spoke to a robotics specialist friend of ours that runs Ministry of Robotics and he said that his robots can take skilled engineers up to half a day to assemble a simple version. So we canned that plan and went with our next best plan of buying a little robot kit. 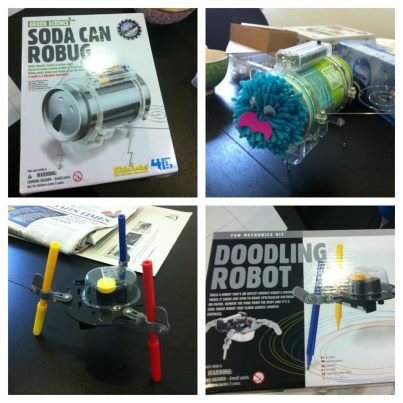 We found some at Toys R Us and settled on a fly-robot and a doodling robot that draws from the spectacular 4M range of science toys. As it turns out, the bots were too hard for Q to fix though the fella had a field day playing with the bit parts, handing stuff to us and being able to handle real tools. We let him take the lead with decorating Ro-Bug and in sharing in the soda in the can we were fervently trying to empty. The kits were fairly straight forward though I would most certainly recommend reading ALL the instructions and accounting for ALL the bit parts BEFORE embarking on building either of these robots. This entry was posted in craft, discovery, discovery kit, education, insects, learning, toys and tagged bugs, building, craft, kit, learning, robot, toys by matchingsocks. Bookmark the permalink.